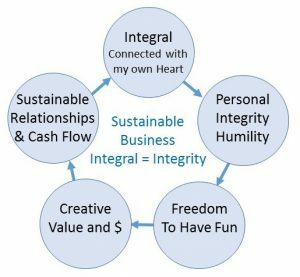 Integral (connected with my heart) naturally leads to integrity. I have nothing to hide and lots to give. Integral means I’m whole. I’m an expression of one part of God’s Kingdom strategy. I’m part of the “whole” purpose which is much bigger than myself. A business is always (and only) sustainable for long periods because of integrity. Customers always look for people they trust and whose stories they know. Integrity is not the outward show of good conduct. Good moral character suggests an external set of rules. Personal self-discipline and external accountability don’t work over a lifetime. “Religion” is generally perceived as the latter (often correctly). People have radar for those who just manage their outward appearances. Real integrity guides us from an integral heart, not a list of rules. I want to live a certain way, and I have a good reason to do so at a heart level. There is no duplicity. What you see is what you get! Integrity means I’m integral with my life’s purpose; my kingdom assignment. I’m marching to a guidance set that is unique to my design and the desires that Father wrote in my heart. Warm-hearted – People (and customers) follow those who are wholehearted. Integral people have fun at work; they are comfortable in their skin and humor is the constant companion of their warmth. Somehow there is a connection between their freedom, their spontaneity, and their creativity. Their enthusiasm pulls others into the same enthusiastic warmth – it’s contagious. They create value for others in their person and their products. They not only attract people, they naturally attract money because people want to buy what they have – It’s not just the product, it’s also the person. It reminds me of the “different spirit” Joshua and Caleb carried. 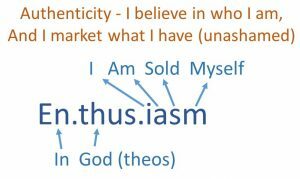 Their unique marketing angle is personal authenticity. They (and their products) are personally reliable. Even when something goes wrong, the relationships continue, and everyone can feel it’s not just for the sake of future business; it’s from the heart. You can feel it originates from God’s heart! “Selling,” capitalism and business can be viewed as tainted for many of us. I don’t sell gifts of grace (healing, prophecy, deliverance, revelation). We were all bought with a price and what we freely received, we all freely give. What we do sell is the work of our hands and the wisdom to implement the grace we have received. Trading has always been part of the Kingdom and money has always been a medium to exchange value that enriches others. We all have bills to pay and providing value for other people is the practical side of ministry that creates wealth. If my “message” doesn’t include a means to follow-up and gain more value, then I don’t really have a message that’s going anywhere (clouds without rain). If what I have adds value to others, they are more than happy to “buy it” and new wealth is created in the process. Many are being invited by God into the business mountain right now. Revelation and wisdom are two wings of the same airplane. We are both practical and spiritual; prophetic and profitable. 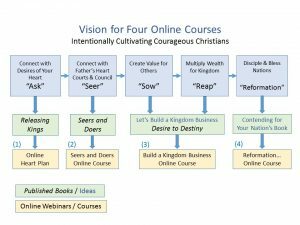 The Online Heart Plan – We’ve been coaching people to connect with what God wrote in their hearts for eight years. We leave them in a place of pursuing the dreams that ignite their zeal for life. It has led to some remarkable career transitions and business startups. To make this process more accessible, we’re going to put it online and compliment it with enough webinar support to make it work for whomsoever. We’ll probably dry run the course through a group of students who will help us iron out the wrinkles while getting clarity on their own hearts and assignments. Let me know if you’re interested (enroll here). 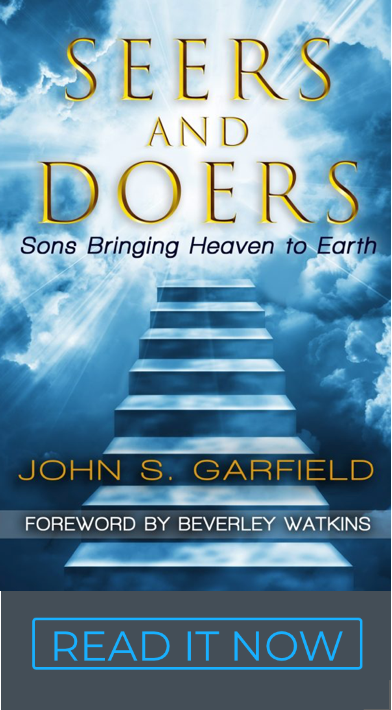 Seers and Doers – When we get the Heart Plan up and running, we’ll make “Seers and Doers” a practical reality for business people with a second online course. I envision two more after that. We’re not done until we have a reformation of nations! These are all tools to build that house. I’m sharing this for your prayer support. Right now, I’m in the middle of learning new software and getting the content for the Heart Plan uploaded. Releasing the hearts of Kings is fun and strategic for the Kingdom! I am forwarding this email to my members, about 50 in 3 chapters.